A Margarita is a popular party drink, as are a few other frozen drinks, that your guests will probably love outside of a bar or restaurant. While you can use a countertop blender that can handle crushing ice to make these drinks, it’s time consuming to do it for lots of people. It means having to measure out the various liquors and flavored liquids properly each time and mixing them with the right amount of ice, which you have to have ready all the time. Instead of enjoying yourself at your own party, you’re going to be mostly behind the bar serving everyone! That’s why with the best frozen margarita machine for your home, you can make the process quicker or even have each guest make their own drinks. Another limitation that blenders have is that they crush the ice to give you a slushie rather than a properly blended drink. The best margarita machine for home use will have an ice reservoir that won’t need to be refilled all that often, if at all. The right amount will be shaved and blended in with the liquids each time a drink is being mixed. There is a tool to measure the right amount of liquids for the margarita or other frozen drink and some machines even automatically measure them out each time. However, a few budget machines are closer to blenders in function, where there is no separate ice chamber but a blending jar with some sort of insulation to keep blended drinks cold. Instead of just crushing ice, they do shave it for better texture as well. Our best margarita machine reviews below cover models ranging from very simple and affordable to top of the line ones that come with lots of features and automatic mixing. You’re bound to be happy with whichever one you choose. If you’d rather just get a powerful blender that can do more than make margaritas and other frozen drinks and are OK with them crushing the ice instead of shaving, check out the best Vitamix or Blendtec models. They will blend anything you throw at them, including crushing big cubes of ice. This Black & Decker XL Blast drink machine comes with a jar that holds up to 72 ounces of liquid and ice for great drinks. The jar is made of Eastman Tritan plastic, but that doesn’t stop it from creating amazing frozen drinks in little to no time at all. That’s because of a surprisingly powerful 650 watt motor. With four different program speeds and a pulse function on this machine, you can mix margaritas, daiquiris, smoothies, and shakes all in this elevated blender. You can even mix up frozen fruit and ice in this machine for a most delicious smoothie. You can plug this machine into an outlet anywhere. The insulation on the chill sleeve keeps the drinks inside cool for hours, keeping them at the perfect consistency as well. The machine includes an easy pour spout that can be closed to keep anything from getting in, and you are less likely to make a mess when dispensing your favorite drink into a glass. The lid fits tightly on the top of the blender to prevent accidental leaks, and the four speeds make it easy to mix anything and everything into your favorite drinks. There’s a removable 2-ounce measuring cup that doubles as an insert that closes the top opening through which you can add ingredients mid-blend. This drink machine is easy to clean and the parts are even dishwasher safe. You can press a button on the control panel and let the machine clean itself before putting the blade and seal-tight lid into the dishwasher for further cleaning. There seems to be nothing lacking on this drink blender. There are a few negative things about this blender that might cause some users to avoid it. The plastic parts tend to be less heavy duty than on other blenders. It is also extremely difficult to find replacement parts for this blender. However, there are many positive things about this blender as well, including the low price and the stylish look that it has. More than a few customers note that it does its singular job very well, and that is to make drinks. This Nostalgia Electrics Margarita & Slush Maker makes drinks in a container that holds one gallon of liquid or frozen beverage. The double-walled chamber helps keep the mixed drink cold for a long time. You can leave the blending dispenser on its base after mixing or you can lift it up by its handle and place it on a party table or counter to let guests dispense their drinks themselves through the spout. Through a dual swivel system, you will get a drink that includes shaved ice and liquid to make a slushy style drink that everyone craves. This machine comes apart easily, so it is easy to clean when it comes time. The motor is powerful enough to shave the ice inside instead of crushing it, to make a better frozen drink than you would get with the small jar that a regular blender has. What does this mean for you? More drink with less preparation time for parties or other events. The machine also includes a convenient storage place for the electrical cord needed to run the machine. You can use any drink mix you want, and the price of this machine is just one of the positive aspects. It is rather easy to clean. However, this machine does not blend fruit. Also, it takes up to ten minutes of running time to get the drink to the right consistency and you have to let it rest in between jobs so as not to burn out the motor. Made with a 36-ounce jar for blending and creating countless drinks, this Margaritaville Bahamas Frozen Concoction Maker can bring the tropics to you! It is the best frozen margarita machine for anyone on a budget and even includes a helper for measuring and adding ingredients, and an ice reservoir from which ice added to the blender jar. The jar is easy to pour and you can get the most out of your drinks without spilling them on the countertop. Its motor is rated at 450W. The No Brainer Mixer acts as a recipe helper and has measurements down its side. You set it on top of the open blender jar with its base in place and add various flavored liquids in the right quantities one at a time, opening the base plate to let the liquids flow into the jar before adding the next ingredient. You can mix up daiquiris, pina coladas, and tasty margaritas for your own use or for parties. When you’ve added all the necessary ingredients, remove the No Brainer Mixer and set the jar on the machine’s base. With the reservoir full of ice on the top, let the mixing process start! This drink maker works on its own by simply plugging in the machine to the wall outlet. The ice reservoir will hold enough ice for one full jar. It includes three different mix cycles to make sure your drinks are mixed to perfection. The three cycles are a shave cycle, a blend cycle, and a shave and blend cycle. You can select the shave cycle alone first so that you control the amount of ice you want and let it drop down into the jar. There is a separate shaver blade at the opening of the reservoir. Then you select the blend cycle to thoroughly mix the ingredients already in the jar with the ice that you just shaved. The jar has pulverizing blades for this. If you want to let the machine handle the entire job, the automatic shave and blend cycle does both of these together to create a delicious drink. It is easy to maintain this machine, and since the parts are dishwasher safe, you can avoid any hand washing of the drink maker. It’s easy to clean and easy to use, and since it is made from glass, the jar is great for the frozen drinks you enjoy. This machine includes a one-year limited warranty. There are many positives to this machine, like the size being large enough to make more than one drink at a time, or the way it shaves ice to create a slushy effect. You can use this product indoors or outdoors for either type of party, and you can make a wide variety of drinks in this maker. However, there is one drawback to this product as well. Since there is only one automatic pre-programmed setting, you only get a fixed amount of ice in every drink if you use it. If you’re more adept at mixing frozen drinks, it is better to use the separate manual functions instead so that each drink can be customized with preferred amounts of ice. 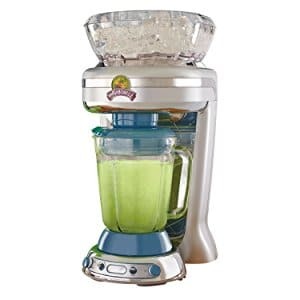 The Margaritaville Key West Frozen Concoction Maker is very similar to the Bahamas model above with the glass jar construction and 450 watt power rating being two similarities. Where is differs is that it comes with an extra large ice reservoir that can hold enough ice for 2.5 to 3 pitchers of drinks. It also comes with 4 pre-programmed drink settings so that you can start it and leave it to finish its job on its own. These are in addition to the manual options of shave, blend, and shave & blend. Be aware that this model does NOT come with the No Brainer Mixer, which is included with the Bahamas model. Once the drink is ready, there’s no need to remove the lid to pour out the contents. Just lift the small hatch on the top and pour and nothing will spill out onto the counter. This Margaritaville Bali drink maker comes in a 60-ounce jar, making it easy for you to make and serve drinks for more guests for parties or other events. You get 4 pre-programmed settings to get the perfect drink consistency for the following types of drinks: Daiquiris, coladas, margaritas, and smoothies. You can even choose a setting to either make a whole batch or a half batch, depending on the number of drinks you plan to make. This maker has a power of 650W, and can hold up to 60-ounces of ice in the reservoir above. If the pre-programmed settings are not to your liking, there are manual controls where you can shave your ice and then blend all the ingredients in the jar. A unique remix channel adds and blends the appropriate ingredients in it. You have full control over the consistency of each drink to allow you to get it as unique as you want. Once the drink is ready, guests can serve themselves directly into their glasses using the self dispenser lever. This drink maker is made from stainless steel accents and a brushed metallic housing. The glass jar is easy to clean, and the parts can be removed for quick and easy cleaning as well. Maintenance is so simple that you won’t dread using your machine for more than one type of drink in the same night. You can simply rinse out the jar and set to work on a new drink type. However, if you want to have more than one drink handy at a time, you can buy extra pitchers and get the drinks ready one after the other. Still, you won’t be able to use the self dispenser on all pitchers at the same time because it has to be set on the base for it to work. There are both pros and cons to this machine, just like any other on the market. It is rather noisy and if you directly add ice to the pitcher instead of using the reservoir and ice shaver, you risk clogging the dispenser. This Margaritaville Tahiti Frozen Concoction mixer is incredibly modern with a three blending jar set up to mix up three different drinks. We rate this as possibly the best home slush machine for a party because you can choose to set up 3 different drinks from 6 different recipe choices. Just set it up and fill each component with the proper ingredients and guests can select a drink and serve themselves. Each jar is 24 ounces, and you can make up to six different drink types, three at a time, to get the party started and keep it going. You can make Daiquiris, Coladas, smoothies, mojitos, mudslides and margaritas with this machine. The way it works is you fill up the extra large ice reservoir and each of the three blending jars and set them all on their bases. Each jar has its own drink recipe dial that you can set individually. For example, select a margarita on the first blender, a daiquiri on the second and a mudslide on the third. The ice reservoir has a fancy ice chute that rotates to deliver shaved ice to each drink jar. Each one blends its own selected drink and they’re all ready to be served. If you want to manually control the amount of shaved ice added or want a little less or more blending for a particular drink, each blender control gives you those options too. This drink mixer is easy to maintain with the removable jars made of glass to make cleaning easy. The mixer has stainless steel accents, brushed aluminum additions, die-cast heavy duty components, and even bamboo wood accents. With a limited one year warranty, you can give your machine a good testing to make sure there are no problems with the mechanics. The noise is about the same as a regular blender. It is easy to surprise your guests with this machine, and you can make the same drinks constantly without having to wash out the jar each time. Your parties will never be the same. Every product has a list of pros and cons that make this product either good or bad. In this case, there are more good things than bad things to talk about. One great thing about this mixer is the fact that you can use whatever mixes you want without any problems. The machine blends easily, and it can help save money on drinks out on the town. One of the negatives is the fact that if something goes wrong, customer service is poor and the pitchers are hard to find if you want a replacement. Also, don’t try to fill up the pitchers beyond a certain line, otherwise they will leak, as a few customers have noted. A frozen margarita machine is just one fun kitchen tool to have for parties at home. Want to have even more fun? Take a look at our useful guide to essential party tools. ← Which is the Best Warming Tray for Food?